Top 5 Breakfast Choices - Bonny Was Fat. Not Anymore. 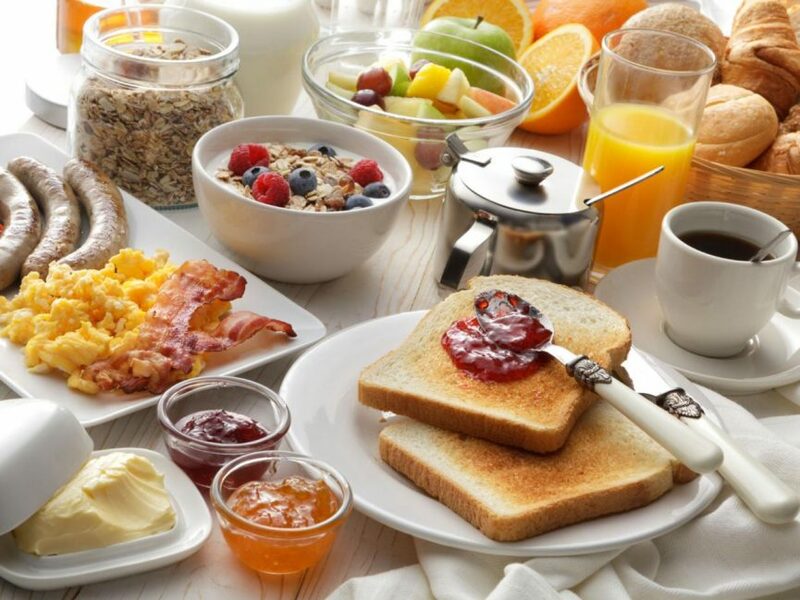 A healthy breakfast should consist of carbs, protein and fiber. This will go a long way in maintaining good health, be it for the weight-loss or maintenance or general fitness. Rich in protein with less calories, a can of Greek yoghurt could keep you full all morning. Top it with some fiber rich fruit like fresh pear (or mangoes – the summer’s bliss) and some almonds for more protein. This hardly requires any prep time and is packed with energy and goodness. – 100 grams of non-fat Greek yoghurt has about 59 cals, 10 g of protein along with calcium and vitamin B-12. – 100 grams of almonds will provide you with 22 g of carbohydrate and 12 g of dietary fiber, 21 g of protein and essential minerals. You may go for a protein packed egg sandwich (minus the cheese to watch your calories) with whole wheat bread and a glass of your favorite fruit juice (without sugar of course). One large egg contains 75 calories, 7 g of high quality protein along with iron, essential minerals, vitamin D and disease fighting nutrients like lutein and zeaxanthin. One slice of whole wheat bread contains 69 calories, 123 mg of sodium, 4 g of protein, 12 g of carbohydrates and 2 g of dietary fibers. A protein packed serving of the delicious peanut butter (on a whole wheat bread or waffles if you do not like it plain), some sliced bananas for fiber and a glass of fat-free milk (you could choose banana milkshake if you don’t mind some extra sugar calories, although you must try and stick to natural sugars from the fruit or you can opt for honey which contains natural sugar and antioxidant properties) will help you fuel a workout and keep you energetic all day long. One medium sized banana is packed with 105 calories, 422 mg of potassium, 27 g of carbohydrate, 3.1 g of dietary fiber and the goodness of vitamins. Two tablespoons of peanut butter can give 8 g of protein, 188 calories and someessential minerals. One cup of low fat milk can give up to 8 g of protein along with a good amount of calcium and 102 calories. For those of you all who trying to lose weight, a couple eggs (in whatever way you like them, hard boiled, scrambled or sunny side up) and cup of green tea (best consumed as a light brew without milk or sugar) which will give a good boost to your metabolism is the perfect choice. The eggs will keep you full for longer and reduce your craving for fatty, greasy foods through the day and give that push you need for burning those fat stores in your body. Yes, Coffee isn’t as bad as it’s touted to be these days. You could definitely add a cup of coffee to your breakfast. Unless you’re on no caffeine mode, coffee is full of rich antioxidants which will keep healthy and give you that little kick you need to go from you cozy bed to a hard toiling day at work. Avoid adding full fat milk and keep the sugar low to cut down on the calories. A cup of coffee can have as much as 95 mg of caffeine. Low fat milk (with honey) and fresh fruit juices can be added with any other breakfast choice and make it healthier, wholesome, hydrating and filling. While choosing your day’s first meal, remember the three golden words – CARBS, PROTEIN and FIBER. Most importantly, apart from picking the right kind of food, never stuff your food into your mouth and gulp it down quickly. Take your time and eat breakfast slowly, not in a rush. This will keep your mood lighter and make you healthier. Why Diets Don't Work? Or Do They? Let's Find Out!